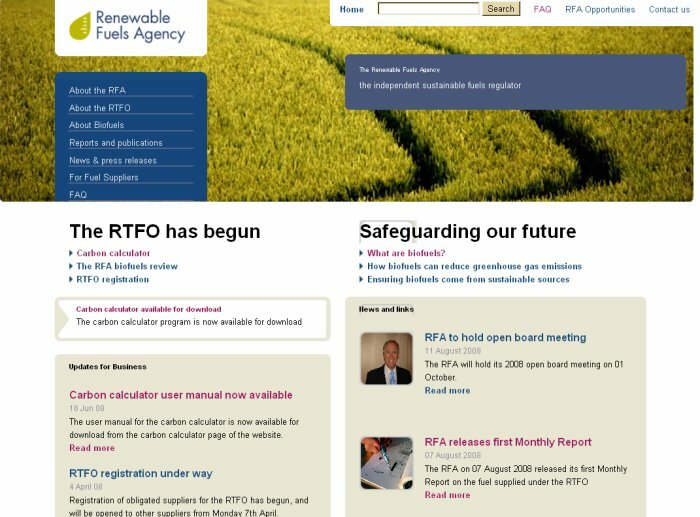 The Renewable Fuels Agency (RFA) (http://www.dft.gov.uk/rfa/) has been set up by the UK Government to implement the Renewable Transport Fuel Obligation (RTFO) (http://www.dft.gov.uk/rfa/aboutthertfo.cfm), which came into force on 1st April 2008. The RTFO obliges fossil fuel suppliers to ensure that by 2010 biofuels account for 5% by volume of the fuel supplied on UK forecourts. The purpose of the RTFO is to “reduce the UK’s contribution to climate change and its reliance on fossil fuels”. The RFA publishes updates on the progress of the RTFO. These include monthly reports on progress on achieving compliance with sustainability criteria and quarterly reports to the Department for Transport and annual reports to parliament. All reports are available on the web site. With serious questions being raised about the impact of biofuels on food prices, farming and the environment in general, it will be interesting to see how long this all carries on. The RFA’s first monthly report has just been published and covers the period 15th April – 14th May 2008. The press release contains some good summary statistics for those of us who need to get hold of such data in a hurry. There are ‘associated files’ (PDF and an Excel spreadsheet) that contain more detailed information. The UK Coal Authority (http://www.coal.gov.uk) aims “to facilitate the proper exploitation of the Nation’s coal resources, whilst providing information and addressing liabilities for which the Authority is responsible, in a professional, efficient and open manner”. If you own or are purchasing a property in a coal mining area there is a search service that will check whether or not the property might be affected by past or existing mining activity. The gazetteer (under Information Services) gives an indication of places in Great Britain that may, or may not, require a mining search to be performed. If you are thinking of moving within the UK it would be as well to check this site as well as the Environment Agency’s ‘In Your Backyard‘ (http://www.environment-agency.gov.uk/maps/), which tells you if the area is at risk of flood and whether there’s a landfill site near your house. The Coal Authority site also has reports on mining activity in the UK and statistics on production. There are links to sites that cover coal mining related topics and information on technologies. The latter includes coal gasification, cleaner coal technologies and environmental issues. These technology ‘fact sheets’ are a good starting point if you need to get up to speed on the industry jargon and how it all works. The following business research skills courses are being run at Manchester Business School from September to October. And yes – I have a vested interest in that I am running the market research workshop! Thanks to Phil Bradley for the alert on this search visualisation tool. 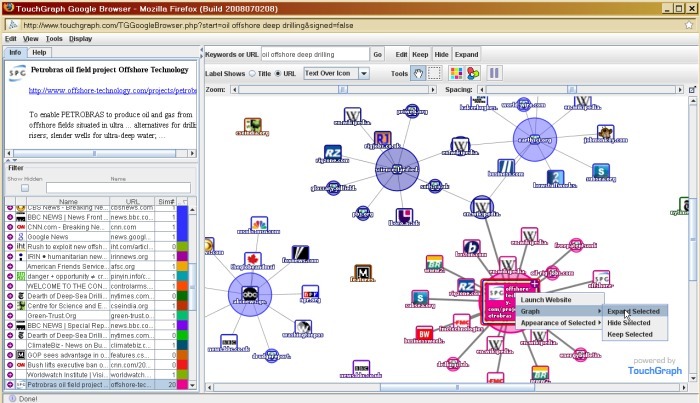 TouchGraph is a Java application that loads into your browser window and displays the networks and connections in your data or a search results list. There are three free demos that tie into Google, Amazon and Facebook. I found the last two very cumbersome to use and limited in their usefulness but the Google one is worth a try. You type in your keywords or a URL and Google’s results are presented as groups of interconnected ‘blobs’. You can zoom in and out, hide or expand individual groupings and filter results, although I must admit to not having yet mastered the last feature. An interesting way to explore search results but I still prefer Cluuz‘s visualisation of web based data. I may find TouchGraph more useful for looking at connections and relationships within my locally held information so I have signed up for a TouchGraph Navigator trial.